This October, we are planning a small Halloween party at our house for the girls with dressing up, lots autumnal foods and treats as well as lots of Halloween-themed decorations, many of them we will make ourselves. Baker Ross sell lots of small craft kits for children to create their own Halloween decorations, you can find them in the Baker Ross Halloween arts, crafts and treats section on their website. 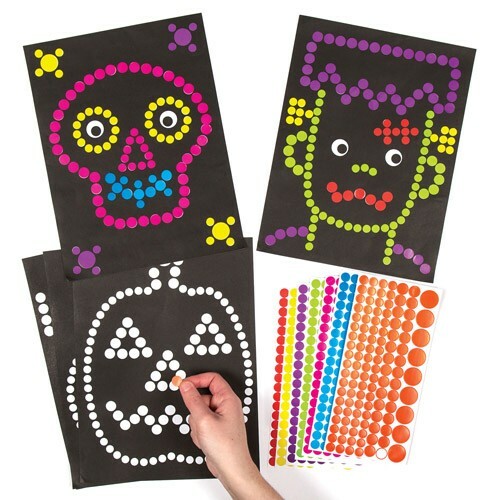 Holly enjoys sticker crafts so I set her to work on these A4-sized Halloween Dotty Art pictures. all you have to do is to choose the coloured dots you want to use and then fill in the patterns on the page. This pack contains 8 pictures featuring bats, skulls, cats, pumpkins and even Frankenstein! For Holly these dotty art sets are a good exercise in concentration because you have to follow the pattern - I don't think I've actually seen her complete one but, coloured or not, they make striking posters for the wall and will be perfect for our house party. No Halloween party would be right without dangling creatures for you to walk into in the dark. Both girls are making jewelled owls to dangle in a line across the room, and furry Halloween pom pom creatures. The Pom Pom kit comes with enough wool to create three different pom pom characters - a spider, a bat and a pumpkin. Pom Poms are fairly easy to make (for slightly bigger hands like Lara's) and you can really bring them to life using the stickers and foam accessories provided in these craft kits. If we hang these from the ceiling they'll be sure to give someone a fright in the dark. These individual kits would make great activities to take part in during a Halloween party. We won't be going trick-or-treating this year but that doesn't mean we won't be having any treats! These little colour-in skull bags are perfect for small treats or party bags to take home a couple of Halloween biscuits from a party. The intricate skull designs feature lots of floral patterns for colouring in - bright colours work best and when coloured in, they remind me of the mexican colours and patterns that characterise Day of the Dead festivities. If your small people are into colouring then you can top up with supplies such as simple packs of fibre-tip pens or other craft essentials when you're ordering art and crafts supplies from Baker Ross.